Jewel Peterson takes eating healthy very seriously. "Kale is my favorite food," Peterson says. Peterson's love of kale would make any parent proud. But the 11 year old never knew her healthy diet would be the reason she would one day find herself sitting right next to kale's most known advocate– Michelle Obama. "When she first walked in I almost fainted because it was so surprising to see the First Lady," Peterson told theGrio.com in an interview. "It's just amazing. It was crazy though but it's something that I will remember for the rest of my life." It all happened on a chilly February day last year at Watkins Elementary School in Washington D.C. The school offers a program titled FoodPrints. It's an educational project in D.C. schools that combines gardening, cooking, nutrition and education. Watkins Elementary started the program in 2012 as a way to get involved with the Let's Move campaign launched by Michelle Obama. "Every year students plant and harvest and then use the fruits and the vegetables that we grow in the garden to bring into the classroom and actually cook and learn about how they can make healthy meals," said Elena Bell, Watkins' principal. The First Lady was so impressed with the program she wanted to see it first-hand, but instead of notifying the school of the pending visit, the White House pretended Home and Garden Television was coming to film the gardens – not even Principal Bell knew Michelle Obama was coming. "We were caught by complete surprise," Bell said. " 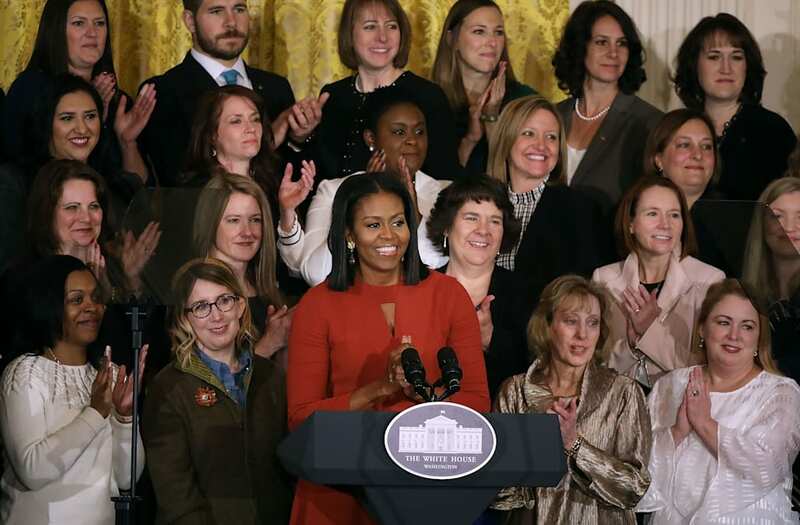 So for me I'm extremely proud to be able to be a principal who had a surprise visit from Mrs. Obama and that she walked in our hallways and she visited our classroom and that she then in turn invited students to the White House so that they could see the garden and experience her work." First Ladies have historically developed their own unique projects and contributions to each presidency. Jacqueline Kennedy was best known for her stunning fashion sense and her role as a "respected ambassador of good will" for the country. Nancy Reagan launched the "Just Say No" campaign in an effort to keep kids off drugs and Eleanor Roosevelt fiercely advocated for equal rights. Obama's Lets Move! campaign has arguably already made a significant impact – focusing on raising a healthier generation of kids by encouraging healthy food choices, nutrition and physical activity. Since Lets Move! began in 2010, it updated school meal nutrition standards for the first time in 15 years. It allows American public schools to offer healthier schools meals and snacks for more than 50 million kids. More than three million kids now have a salad bar in their school and more than 12 million kids now attend schools that ensure 60 minutes of physical activity each day and that's just some of the initiatives accomplishments. As a part of the initiative, along with partnering with schools across the country, the first lady opened the White House to hundreds of children from diverse backgrounds to experience the gardens on the South Lawn. It's something the Washington Youth Garden, who are partners with the Let's Move campaign says has changed the 'face' of gardening. "[Gardening] is something that [is seen] as more for the white privilege class I feel like," said Nadia Mercer, Washington Youth Garden's program director. "But [Michelle Obama] was saying no we're taking back this gardening experience we're going to grow food for our community and it's accessible for everybody." Registered Dietician, Rebecca Mohning tells theGrio.com Michelle Obama has really laid out a blueprint for what households should consider when it comes to food and nutrition. "I would look at it [the White House garden] almost as if she's planted some type of tree right and they're not going to tear it down the moment she leaves," Mohning said. "I think that it will sustain , I don't know to what extent and how much, I could see this as definitely being something [the Trump administration] wants to continue." According to the Centers for Disease and Control and Prevention, childhood obesity has more than doubled in children and quadrupled in adolescents in the past 30 years. By 2012, more than a third of children and adolescents were overweight. So let's be very clear, this isn't just a trend. It's not a passing fad. This healthy eating stuff, it's here to stay, and we now have everything we need to seize the opportunity and give all our kids the healthy futures they so richly deserve. It's isn't clear how Let's Move! will be treated by the incoming Trump administration. The first lady said she intends to continue to work to "solve the problem" of childhood obesity because there's "still a long way to go." Ashantai Hathaway is a reporter at theGrio. Keep up with her on Twitter @ashantaih83.